Russian actress and author Lidya Ryndina (1884-1957) was with Vera Kholodnaya and Vera Karalli one of the three major film divas of the Russian silent cinema during the Imperial era. After the Russian Revolution, she moved to Western Europe where she also made a few silent films during the 1920s. Russian Postcard. Collection: Didier Hanson. Lidiya Dmitrievna Ryndina (Лидия Дмитриевна РЫНДИНА or Lidiya T. Ryndina according to IMDb) was born in 1884. She was a daughter of a Russian General. Ryndina started her career as a stage actress in Kiev. She later performed at the Alexandrinsky Theatre in Saint Petersburg, and the Korsh Theatre and the Nezlobin Theatre in Moscow. In 1913, Lidya Ryndina started to appear in films for producer Iosif N. Ermoliev (also written as Iosif Yermolyev or Joseph N.Ermolieff). Ermoliev (1889-1962) was a prominent pioneer of the Russian film industry, who started his career in 1907 as a technician for the Pathé company. At twenty-two he already operated a studio in Moscow and during the revolution of 1917, he escaped to France where he worked again for Pathé. 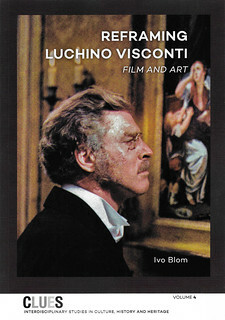 He produced over two hundred films in Europe before moving to the U.S. in 1937. 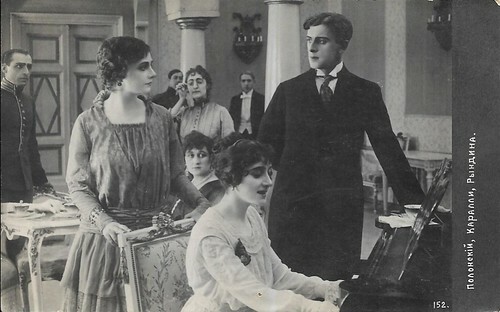 Ryndina became known with roles in such silent Russian films as Peterburgskiye trushchobi/The Lower Depths of St. Petersburg (Pyotr Chardynin, Vladimir Gardin, Yakov Protazanov, 1915) with Vladimir Maksimov and Ivan Mozzhukhin, and Nikolay Stavrogin (Yakov Protazanov, 1915) with Ivan Mozzhukhin and Nathalie Lissenko. The latter was based on Fyodor Dostoevsky’s story Devils. Ryndina worked several times with the most important filmmaker of the early Russian cinema, Yevgeni Bauer. 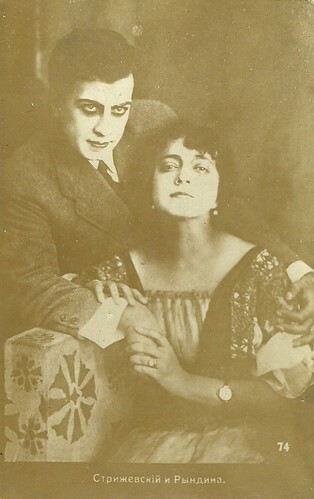 Their films include Lulia Bek (Yevgeni Bauer, 1914), Vozmezdie/Retribution (Yevgeni Bauer, 1916) with Vitold Polonsky and Vera Karalli, and Lozh/Lie (Yevgeni Bauer, 1916). 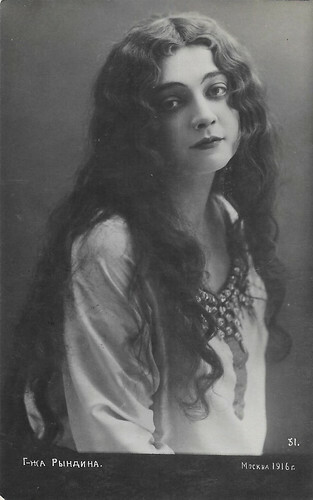 She also co-starred with Vladimir Strizhevsky in Zhizn trekh dney/A life of three days (Gromov, 1917). Russian Postcard, no. 151. Collection: Didier Hanson. 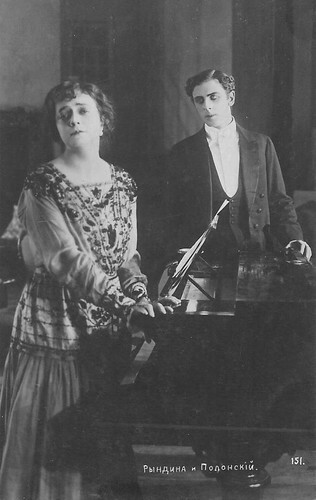 Photo: publicity still for Vozmezdie/Retribution (Yevgeni Bauer, 1916) with Vitold Polonsky. Russian Postcard, no. 152. Collection: Didier Hanson. 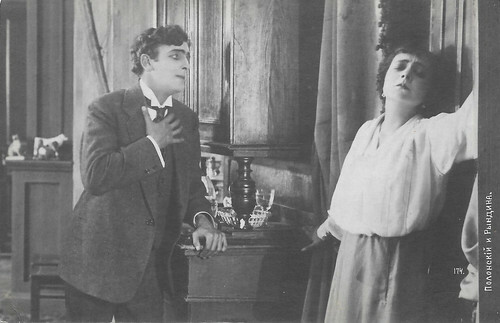 Photo: publicity still for Vozmezdie/Retribution (Yevgeni Bauer, 1916) with Vera Karalli and Vitold Polonsky. Lidiya Ryndina left Russia because after the Russian Revolution. In fact in 1917, there was a pair of revolutions in Russia in 1917 which dismantled the Tsarist autocracy and led to the rise of the Soviet Union. In 1919, Ryndina first went to the Krim, then to Constantinople and from there to Western Europe. 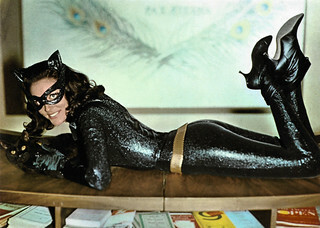 In Austria, and later in Germany, she was able to appear in few films during the 1920s. In 1922, she appeared in Der Unbekannte aus Russland/The Unknown from Russia (Hans Otto, 1922), based on a script by Béla Balázs. She also appeared in a supporting part in Der Mann auf dem Kometen/The Man on the Comet (Alfred Halm, 1925) with Luciano Albertini and Maly Delschaft. After the war, she moved to Paris, where she played in Henrik Ibsen’s play Ghosts. Lidya Ryndina passed away in Paris in 1957 (according to Russian Wikipedia in 1964). She was married twice, first to a man called Brylkin and later to the Russian poet and publisher Sergey Alexeevich Sokolov-Krechetov. With Vitold Polonsky. Russian postcard, no. 174. Collection Didier Hanson. Vladimir Strizhevsky and Lidiya Ryndina. Russian postcard, no. 74. Collection: Didier Hanson. 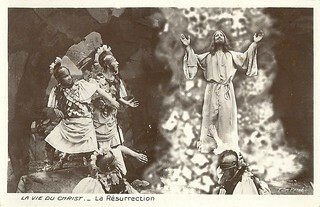 Source: Čiurlionis, Find A Grave, Ciné-Phil-Azr (French), Wikipedia (Russian) and IMDb.